Minimum quantity to order is 2 boxes. Box Size: 9" wide x 5" deep x 5" tall. 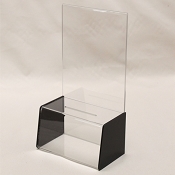 Slot Size: 4.25" x .25"
This deluxe acrylic box is made with thicker black plastic sides to create a more elegant appeal. Slot is on the top middle. This is a nice multipurpose box that can be used for collecting donations or suggestions or leads. 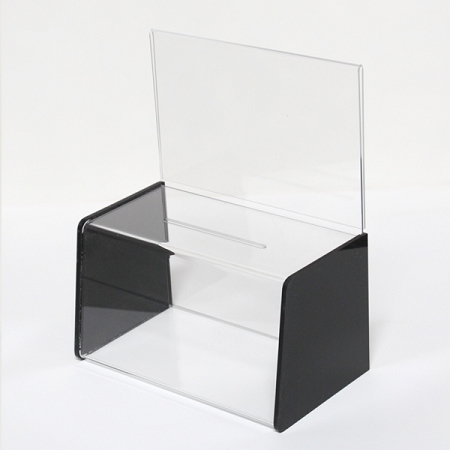 The wide style of this box gives it a highly visible presence when placed in store locations. Back piece easily slides into back, lift it up to grab contents inside entry box. 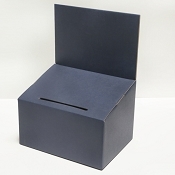 This box is ideal for, casting ballots, comments, raffles, or for collecting donations. Easily slide your own graphics into sign sign holder (8.5" x 5.5"h). Pen, artwork, pad are sold separately. the shipping was fast and the boxes are great and of good quality.